This occurred in the City of Oak Harbor Washington which is on beautiful Whidby Island. But the beauty of the island was marred somewhat recently by the bad behavior of Councilman Rick Almberg. While disabled veteran Lucas Yonkman was speaking during a citizen comment period about the need to protect our Second Amendment rights, Councilman Almberg tried to advance a motion banning permit holders from carrying at meetings despite being advised by the City Attorney that Washington’s preemption law would make such a motion moot. I should note that Mayor Scott Dudley does a great job of both apologizing to the disabled veteran who was the subject of the anti-American rant and of defending our rights. Might I suggest that those who live in this town take it upon themselves to attend every single City Council meeting while open carrying. 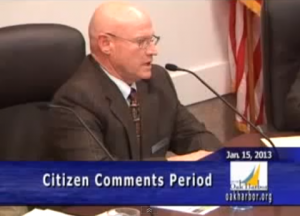 Perhaps Councilman Almberg’s irrational fear will require him to resign from the Council. Read more at Island Politics. This entry was posted in Abuse of Power, Washington. Bookmark the permalink.